Breaking New Music, Sharing Stories and Pushing CULTURE! ‘You Alright Yeah?’ is hotting up to be the biggest record on the planet right now, with A-listers from Beyonce to Stormzy giving it their co-sign, alongside premiership footballers such as Jack Whilshire and Benik Afobe. The record is the second to cause an online eruption after Don-E initially burst on to the scene in 2015 with viral hit ‘Balenciaga’ featuring Kojo Funds & Yxng Bane. Teaming up once again with production powerhouse, Dr Vades, who are responsible for co-producing hits including Bryson Tiller ‘Don’t’, Yxne Bane ‘Fine Wine’, and Kojo Funds ‘Dun Talkin’, ‘You Alright Yeah’ is inspired by the recent sounds and musical styles of his peers. Don-E offers up this super charged, afro-rap monster that is destined to spawn the next dance craze on the streets, thanks to it’s sing-a-long hook and unforgettable ad-libs. Want to see them perform live? 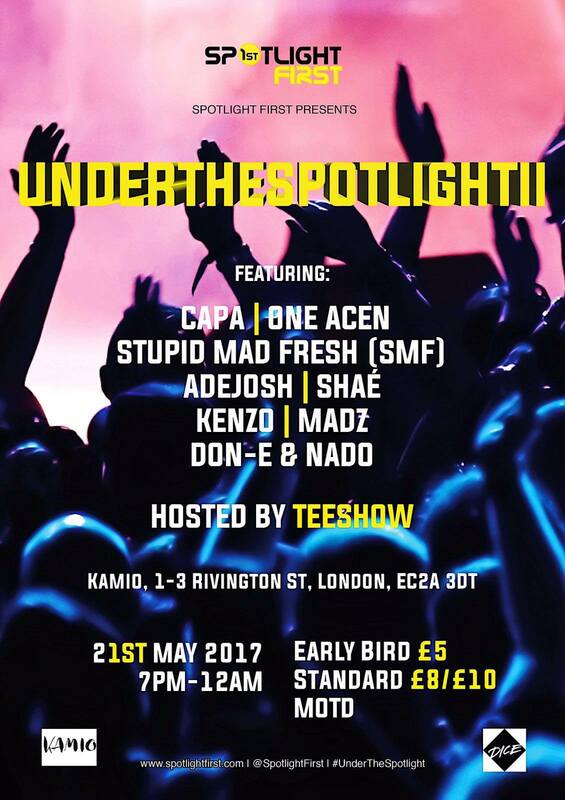 Catch Don E and Nado amongst an amazing line up of talents at SpotlightFirst’s UnderTheSpotlightII on the 21st of May 2017.